When my Osprey Aura 50 pack was shiny and new. When asked about thru-hiking the Pacific Crest Trail, I often get a lot of questions about my resupply strategy. What was my resupply strategy? Did I carry all of my food with me on the entire trail? Did I mail myself resupply boxes? What towns did I mail my resupply boxes to? Did I resupply in town? How often did I have to resupply? Did I ever run out of food? For my thru-hike in 2018, I resupplied on trail in 20 towns, sent myself 9 resupply boxes and tried sending myself 2 Bounce Boxes. I say “tried” because the second Bounce Box I sent to myself was lost and eventually sent back to me at home, long after I had completed my hike. Did I carry all of my food with me on the entire trail? No way. It’s impossible to carry all the food you’d need to eat for 2,650 miles. When doing a long-distance hike, hikers will either send themselves resupply boxes on trail or they’ll buy whatever they need along the way whenever they go into town. I did a little bit of both – sent myself resupply boxes and resupplied on trail. I had planned on stopping at the following towns: Etna, Seiad Valley, Ashland, Shelter Cover and Sisters, but missed them due to skipping ahead because of the thick smoke from the wildfires and needing to get to Cascade Locks in time for PCT Trail Days. Instead, my hiking partner, Grit and I rented a car and became Trail Angels for three days in Oregon on our way to Timberline Lodge. Where did I send myself resupply boxes on trail in 2018? I sent myself a resupply (or bounce) box to the 10 town stops I’ve listed below and have indicated the number of days of food I packed in each box. If you’re a hiker who has specific dietary restrictions like being vegan, following a keto diet, is gluten-intolerant or has food allergies, you’ll probably benefit from sending yourself resupply boxes on trail because most resupply options on trail, especially in smaller towns, can be extremely limited to food choices like instant mashed potatoes, packets of Top Ramen and Snickers Bars. Another benefit for resupply boxes would be if a hiker wants to add a wide variety to their on-trail diet by preparing dehydrated foods from home and sending them to themselves on trail. One thing to consider when sending resupply boxes on trail would be cost. Most thru-hikers use the USPS Priority Mail option. Packages are charged a flat rate, instead of by weight. Depending on the size of box used, sending a box via Priority Mail can range from $13.65 for a medium flat rate box to $18.90 for a large flat rate box. Mailing resupply boxes can get expensive quick, not only with postage, but also with pickup fees. Post offices don’t charge a pickup fee to hikers, but most other businesses do. Pickup fees can range anywhere from $5 to $50, depending on the town stop. These fees are charged when a hiker picks up their box. Every box gets charged a fee so for example if you have three boxes waiting for you and the fee to pick them up is $10, you’ll pay a total of $30 just to pick your boxes. Another thing hikers need to consider when shipping their resupply boxes to post offices is the business hours of the post office they’ll be picking up their package from. Every post office can have slightly different hours and days of operation. There’s a possibility you’ll have to modify your hiking schedule around a post office’s wacky hours and being closed on weekends and holidays. Sending resupply boxes to businesses rather than post offices might be more expensive, but could be a better choice because their hours of operation are generally more flexible. Another thing to think about when it comes to sending resupply boxes, especially before getting on trail, is the possibility of getting sick of the food you send to yourself. Before I left to hike the PCT in 2018, the Mountain House “Breakfast Skillet” dehydrated meal was one of my favorite things to eat in the backcountry. After eating it every day for a month in a row, I got sick of it. It became one of the first things I gave away to other hikers or donated to a hiker box whenever I got a new resupply box. I also felt the same way about instant mashed potatoes and Rice Krispy Treats. What you want to eat today might not be the same food you want to eat in a month or two. How do you send yourself a resupply box on trail? When putting together a resupply strategy, decide ahead of time where you’d want to send yourself a box on trail and note the addresses. This will save you time on having to research this information while on trail. If you’re sending a box to a post office, you’ll want to address the box to “General Delivery” along with the city, state and zip code of the post office you’re sending the box to. Whether you’re sending a box to a post office or a business, you’ll also want to note, “Please Hold For PCT Hiker” and write your first and last name along with your ETA (Estimated Date of Arrival) in the MM/DD/YY format on the box. Post offices and businesses along trail that choose to accept packages for hikers are inundated with packages during hiker season. Make sure the package stands out and is easy to identify. Write your last name on all sides of the box, use colorful, unique and distinctive tape and/or stickers to mark the outside of the box. Other best practices for sending resupply boxes? Make sure you have a valid, government issued photo ID. You’ll need to identify yourself when picking up your box. Also, be sure to allow enough time for shipping. You don’t want to show up in town before your box does. Did I ever run out of food? One of my biggest fears when planning my 2018 PCT thru-hike was running out of food. I’m happy to report that I never ran out of food, although I did come close on my way into Trout Lake, Washington when I only had one packet of ramen left in my food bag. Most of the time, I carried way too much food. My food bag was always obnoxiously heavy. When putting together my resupply strategy, I used a free online resource called Craig’s PCT Planner to choose my town stops, figure out my hiking pace, determine how long it would take to get to each stop and has space to write notes for each town stop. In the notes section, I’d include any special gear I needed to pick up for the upcoming section, restaurants I wanted to check out in town, trail angel information, lodging details and addresses for where I could send myself a resupply box if I needed to. I highly recommend resupplying as you go in the bigger towns and sending yourself a resupply box to the smaller, remote locations on trail. Whatever you choose, be sure to keep it simple. While you’re in town, don’t be afraid to shop out of the Hiker Boxes. With Hiker Boxes, practice the “leave a little, take a little” philosophy. Only take what you need and give what you don’t need or want to carry. Hiker Boxes can be found in trail towns at hotels, hostels, trail angel houses and various businesses around town. 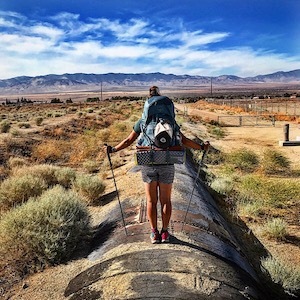 You can usually find a wide variety of food, extra gear, half-used fuel canisters, books, sunscreen, extra Ziploc bags, clothes and shoes in any given Hiker Box along the trail.